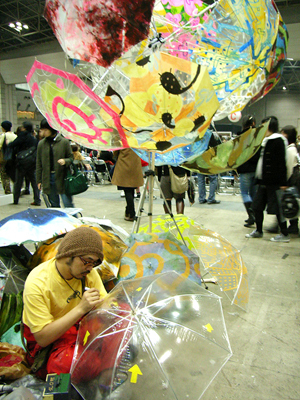 “Design Festa! 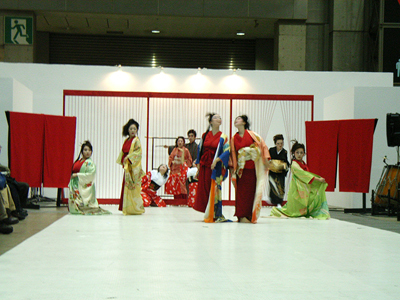 vol.24” was held on December 2nd (Sat) and 3rd (Sun) at Tokyo Big Sight. This big event with more than 6,000 artists and 2,600 booths has been introduced several times on Shift. 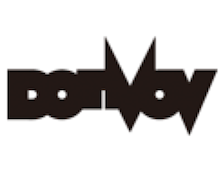 This time, I would like to introduce “How to Walk at Design Festa” of my own. I spoke with many people at this event. 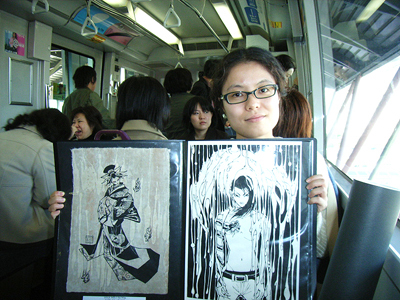 Firstly, I took a train “Yurikamome line” from Shinbashi station to the venue Tokyo Big Sight, and happened to meet a girl with her illustration who was one of the exhibitors of Design Festa. I thought she looked like an art school student, but she actually had a very unique career; she studied the gene at the university, and now drawing pictures while working as a pharmacist. 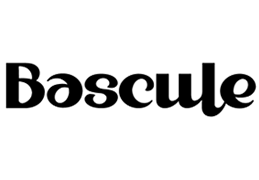 Speaking with many other exhibitors at the venue, I found that they had various careers, including Illustrator, Photographer, Programmer, Theatrical company’s member and Chief executive etc.. Their home places were also various from Kyushu to Hokkaido, and also foreign countries. 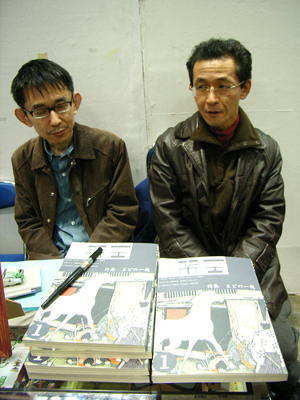 Speaking with various people is also one of the enjoyable features of this event, as well as watching their works. The original characters and illustration works were remarkable. 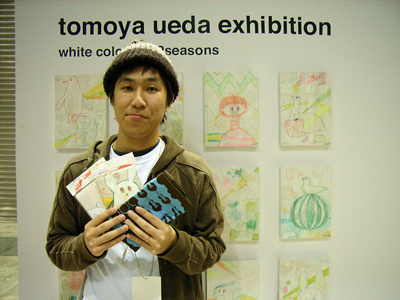 Illustration works by Mr.Tomoya Ueda. 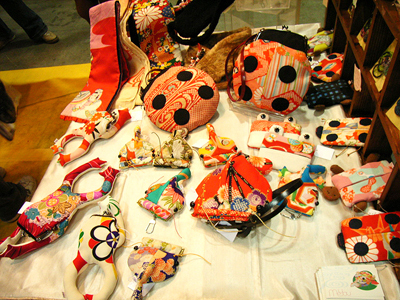 Handmade commodities (Japanese taste flog, fish etc..) by Miss Meyou. This artist was single-mindedly drawing the picture on umbrellas. His usual activity base is Inogashira Park. This artist was making a little planetarium dome. 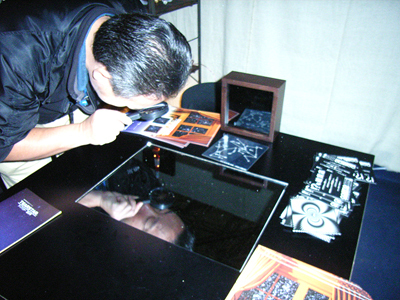 It seems to take a lot of time and effort because of the hand work. 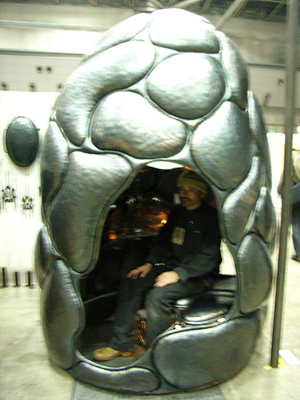 He is an iron artist, making from small goods to the huge house with all iron. The work somehow had a warm feel. 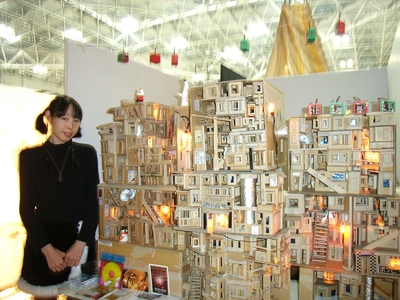 The house by corrugated cardboards. It was very detailed. 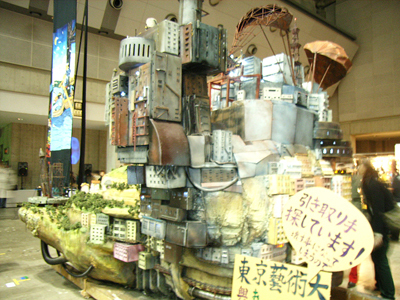 The huge ship objet by Tokyo National University of Fine Arts & Music was marketed. 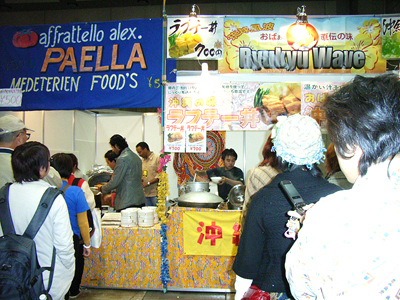 If you get tired by walking around many booths, you can take a rest at food stalls in Restaurant & Cafe/Bar Area. I tried a pork rice bowl at Okinawa booth. It tasted good. 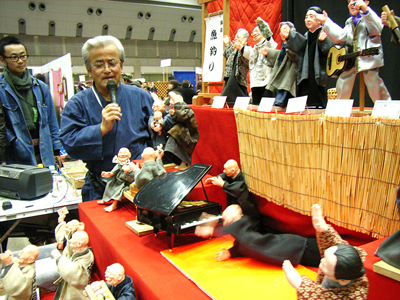 A puppet show “Shokichi” attracted many people. It was very interesting! This cartoon booth showed a bit different atmosphere from surroundings. They told me that it was a new magazine “Kaku (Fictitious)” made by cartoonists of a famous Japanese underground comic magazine “Garo”. I instinctively bought one and asked their autograph on it. 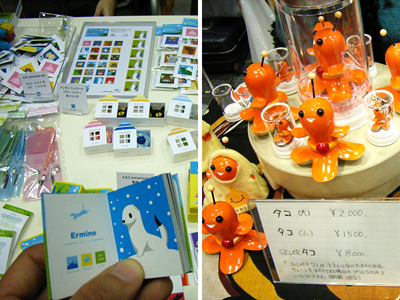 There were a lot of people who were making free papers with some goods. 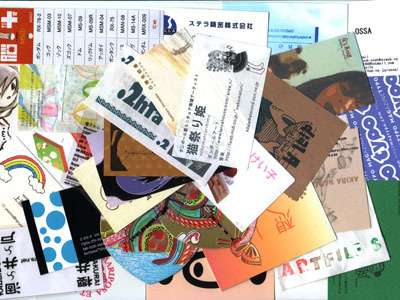 I collected so many cards and papers by going round. 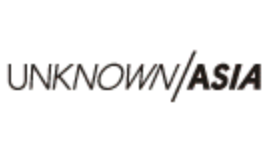 It is enjoyable to watch such a wide variety of these papers. 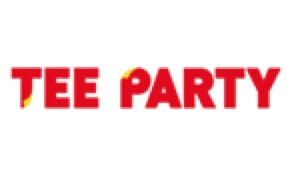 I tried to see all booths, but it took many hours and I got very tired. 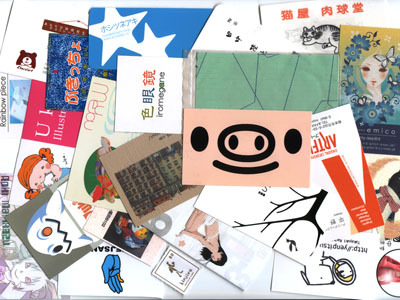 You should try not to go around in order as you cannot see all spaces at one time, but choose your favorite area to go first, because I found many great works in the far spaces also, which didn’t have enough visitors. There were both great excitement and inconvenience in this chaos. 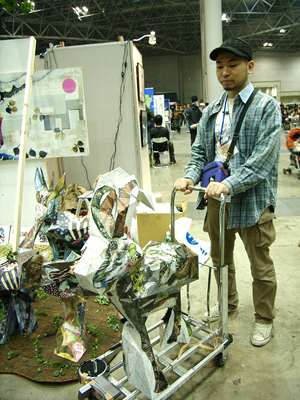 I felt the style of Design Festa rather than the trend or fashion. 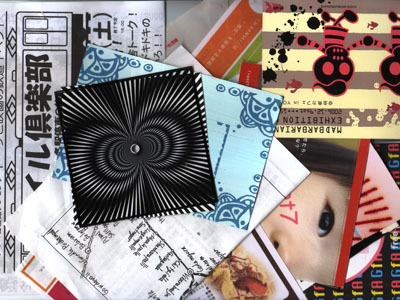 Next Design festa will be on May 2007. I hope this event will keep producing nice things more and more.